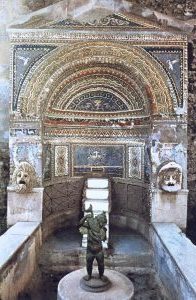 I've never been into the garden of the House of the Great Fountain, but its mosaic and shell-decorated fountain is visible from the street. This most famous "backyard" fountain is decorated with tiny mosaic pieces that have been set into a pattern that is reminiscent of an oriental rug. The motif is somewhat Egyptian. Tragic theatrical masks of marble are attached on the sides. Water flowed down the steps behind the statuette of a boy carrying a dolphin.